For other uses, see Green Revolution (disambiguation). Both the Ford Foundation and the Rockefeller Foundation were heavily involved. One key leader was Norman Borlaug, the "Father of the Green Revolution", who received the Nobel Peace Prize in 1970. He is credited with saving over a billion people from starvation. The basic approach was the development of high-yielding varieties of cereal grains, expansion of irrigation infrastructure, modernization of management techniques, distribution of hybridized seeds, synthetic fertilizers, and pesticides to farmers. Mexico was the recipient of Green Revolution knowledge and technology, and it was an active participant with financial support from the government for agriculture as well as Mexican agronomists. Although the Mexican Revolution had broken the back of the hacienda system and land reform in Mexico had by 1940 distributed a large expanse of land in central and southern Mexico, agricultural productivity had fallen. During the administration of Manuel Avila Camacho (1940–46), the government put resources into developing new breeds of plants and partnered with the Rockefeller Foundation. In 1943, the Mexican government founded the International Maize and Wheat Improvement Center (CIMMYT), which became a base for international agricultural research. Agriculture in Mexico had been a sociopolitical issue, a key factor in some regions' participation in the Mexican Revolution. It was also a technical issue, enabled by a cohort of trained agronomists, who were to advise peasants how to increase productivity. In the post-World War II era, the government sought development in agriculture that bettered technological aspects of agriculture in regions that were not dominated by small-scale peasant cultivators. This drive for agricultural transformation would have the benefit of keeping Mexico self-sufficient in food and in the political sphere with the Cold War, potentially stem unrest and the appeal of Communism. Technical aid can be seen as also serving political ends in the international sphere. In Mexico, it also served political ends, separating peasant agriculture based on the ejido and considered one of the victories of the Mexican Revolution, from agribusiness that requires large-scale land ownership, irrigation, specialized seeds, fertilizers, and pesticides, machinery, and a low-wage paid labor force. India soon adopted IR8 – a semi-dwarf rice variety developed by the International Rice Research Institute (IRRI) that could produce more grains of rice per plant when grown with certain fertilizers and irrigation. In 1968, Indian agronomist S.K. De Datta published his findings that IR8 rice yielded about 5 tons per hectare with no fertilizer, and almost 10 tons per hectare under optimal conditions. This was 10 times the yield of traditional rice. IR8 was a success throughout Asia, and dubbed the "Miracle Rice". IR8 was also developed into Semi-dwarf IR36. Wheat yields in least developed countries since 1961, in kilograms per hectare. In the 1960s, rice yields in India were about two tons per hectare; by the mid-1990s, they had risen to six tons per hectare. In the 1970s, rice cost about $550 a ton; in 2001, it cost under $200 a ton. India became one of the world's most successful rice producers, and is now a major rice exporter, shipping nearly 4.5 million tons in 2006. In 1970, foundation officials proposed a worldwide network of agricultural research centers under a permanent secretariat. This was further supported and developed by the World Bank; on 19 May 1971, the Consultative Group on International Agricultural Research (CGIAR) was established. co-sponsored by the FAO, IFAD and UNDP. CGIAR has added many research centers throughout the world. CGIAR has responded, at least in part, to criticisms of Green Revolution methodologies. This began in the 1980s, and mainly was a result of pressure from donor organizations. Methods like Agroecosystem Analysis and Farming System Research have been adopted to gain a more holistic view of agriculture. New varieties of wheat and other grains were instrumental to the green revolution. Plant scientists figured out several parameters related to the high yield and identified the related genes which control the plant height and tiller number. With advances in molecular genetics, the mutant genes responsible for Arabidopsis thaliana genes (GA 20-oxidase,  ga1,  ga1-3 ), wheat reduced-height genes (Rht)  and a rice semidwarf gene (sd1)  were cloned. These were identified as gibberellin biosynthesis genes or cellular signaling component genes. Stem growth in the mutant background is significantly reduced leading to the dwarf phenotype. Photosynthetic investment in the stem is reduced dramatically as the shorter plants are inherently more stable mechanically. Assimilates become redirected to grain production, amplifying in particular the effect of chemical fertilizers on commercial yield. The effects of the Green Revolution on global food security are difficult to assess because of the complexities involved in food systems. 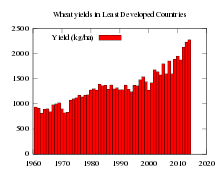 Some criticisms generally involve some variation of the Malthusian principle of population. Such concerns often revolve around the idea that the Green Revolution is unsustainable,  and argue that humanity is now in a state of overpopulation or overshoot with regards to the sustainable carrying capacity and ecological demands on the Earth. However, Borlaug was well aware of the implications of population growth. In his Nobel lecture he repeatedly presented improvements in food production within a sober understanding of the context of population. "The green revolution has won a temporary success in man's war against hunger and deprivation; it has given man a breathing space. If fully implemented, the revolution can provide sufficient food for sustenance during the next three decades. But the frightening power of human reproduction must also be curbed; otherwise the success of the green revolution will be ephemeral only. Most people still fail to comprehend the magnitude and menace of the "Population Monster"...Since man is potentially a rational being, however, I am confident that within the next two decades he will recognize the self-destructive course he steers along the road of irresponsible population growth..."
The primary objective of the program was geopolitical: to provide food for the populace in undeveloped countries and so bring social stability and weaken the fomenting of communist insurgency. The spread of Green Revolution agriculture affected both agricultural biodiversity (or agrodiversity) and wild biodiversity. There is little disagreement that the Green Revolution acted to reduce agricultural biodiversity, as it relied on just a few high-yield varieties of each crop. This has led to concerns about the susceptibility of a food supply to pathogens that cannot be controlled by agrochemicals, as well as the permanent loss of many valuable genetic traits bred into traditional varieties over thousands of years. To address these concerns, massive seed banks such as Consultative Group on International Agricultural Research’s (CGIAR) International Plant Genetic Resources Institute (now Bioversity International) have been established (see Svalbard Global Seed Vault). There are varying opinions about the effect of the Green Revolution on wild biodiversity. One hypothesis speculates that by increasing production per unit of land area, agriculture will not need to expand into new, uncultivated areas to feed a growing human population. However, land degradation and soil nutrients depletion have forced farmers to clear up formerly forested areas in order to keep up with production. 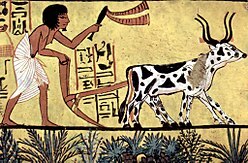 A counter-hypothesis speculates that biodiversity was sacrificed because traditional systems of agriculture that were displaced sometimes incorporated practices to preserve wild biodiversity, and because the Green Revolution expanded agricultural development into new areas where it was once unprofitable or too arid. For example, the development of wheat varieties tolerant to acid soil conditions with high aluminium content, permitted the introduction of agriculture in sensitive Brazilian ecosystems such as Cerrado semi-humid tropical savanna and Amazon rainforest in the geoeconomic macroregions of Centro-Sul and Amazônia. Before the Green Revolution, other Brazilian ecosystems were also significantly damaged by human activity, such as the once 1st or 2nd main contributor to Brazilian megadiversity Atlantic Rainforest (above 85% of deforestation in the 1980s, about 95% after the 2010s) and the important xeric shrublands called Caatinga mainly in Northeastern Brazil (about 40% in the 1980s, about 50% after the 2010s – deforestation of the Caatinga biome is generally associated with greater risks of desertification). This also caused many animal species to suffer due to their damaged habitats. Nevertheless, the world community has clearly acknowledged the negative aspects of agricultural expansion as the 1992 Rio Treaty, signed by 189 nations, has generated numerous national Biodiversity Action Plans which assign significant biodiversity loss to agriculture's expansion into new domains. Most high intensity agricultural production is highly reliant on non-renewable resources. Agricultural machinery and transport, as well as the production of pesticides and nitrates all depend on fossil fuels. Moreover, the essential mineral nutrient phosphorus is often a limiting factor in crop cultivation, while phosphorus mines are rapidly being depleted worldwide. The failure to depart from these non-sustainable agricultural production methods could potentially lead to a large scale collapse of the current system of intensive food production within this century. Although the Green Revolution has been able to improve agricultural output in some regions in the world, there was and is still room for improvement. As a result, many organizations continue to invent new ways to improve the techniques already used in the Green Revolution. Frequently quoted inventions are the System of Rice Intensification,  marker-assisted selection,  agroecology,  and applying existing technologies to agricultural problems of the developing world. Current challenges for nations trying to modernize their agriculture include closing the urban-rural income gap, integration of smallholders into value chains, and maintaining competitiveness in the market. However, in low-income countries, chronic problems such as poverty and hunger cause agricultural modernization efforts constrained. It is projected that global populations by 2050 will increase by one-third and as such will require a 70% increase in the production of food. As such, the Second Green Revolution will likely focus on improving tolerances to pests and disease in addition to technological input use efficiency. ^ Hazell, Peter B.R. (2009). The Asian Green Revolution. IFPRI Discussion Paper. Intl Food Policy Res Inst. GGKEY:HS2UT4LADZD. ^ Farmer, B. H. (1986). "Perspectives on the 'Green Revolution'in South Asia". Modern Asian Studies. 20 (1): 175–99. doi: 10.1017/s0026749x00013627. ^ Gaud, William S. (8 March 1968). "The Green Revolution: Accomplishments and Apprehensions". AgBioWorld. Retrieved 8 August 2011. ^ Joseph Cotter, Troubled Harvest: Agronomy and Revolution in Mexico, 1880–2002, Westport, CT: Praeger. Contributions in Latin American Studies, no. 22, 2003, p. 1. ^ David Barkin, "Food Production, Consumption, and Policy", Encyclopedia of Mexico vol. 1, p. 494. Chicago: Fitzroy Dearborn 1997. ^ Barkin, "Food Production", p. 494. ^ Jennifer, Clapp. Food. p. 34. ^ "Rice paddies". FAO Fisheries & Aquaculture. Retrieved 20 March 2011. ^ "Rice of the Gods". Time. 14 June 1968. Retrieved 20 March 2011. ^ "India Girds for Famine Linked With Flowering of Bamboo". News.nationalgeographic.com. Archived from the original on 5 August 2011. Retrieved 13 August 2010. ^ "Newsroom: News Releases". CGIAR. Archived from the original on 26 June 2010. Retrieved 13 August 2010. ^ Rowlatt, Justin (1 December 2016). "IR8: The miracle rice which saved millions of lives". BBC News. Retrieved 5 December 2016. ^ De Datta SK, Tauro AC, Balaoing SN (1 November 1968). "Effect of plant type and nitrogen level on growth characteristics and grain yield of indica rice in the tropics". Agron. J. 60 (6): 643–47. doi: 10.2134/agronj1968.00021962006000060017x. Archived from the original on 2 December 2008. ^ Barta, Patrick (28 July 2007). "Feeding Billions, A Grain at a Time". The Wall Street Journal. p. A1. ^ Groniger, Wout (2009). Debating Development – A historical analysis of the Sasakawa Global 2000 project in Ghana and indigenous knowledge as an alternative approach to agricultural development (Master thesis). Universiteit Utrecht. Archived from the original on 3 March 2012. ^ a b c Emile Frison (May 2008). "Biodiversity: Indispensable resources". D+C. 49 (5): 190–93. Archived from the original on 8 December 2008. If there is to be a Green Revolution for Africa, it will be necessary to breed improved varieties and, indeed, livestock. That task will depend on access to the genetic resources inherent in agricultural biodiversity. However, biodiversity is also important for tackling malnutrition as well as food security. ^ Dugger, Celia W. (10 October 2007). "In Africa, Prosperity From Seeds Falls Short". The New York Times. Retrieved 20 March 2011. ^ Chibwana, Christopher; Fisher, Monica. "The Impacts of Agricultural Input Subsidies in Malawi". International Food Policy Research Institute. Retrieved 7 October 2016. ^ Malawi Miracle article on the BBC website. According to the UN website on Malawi the program was highly effective. This website highlights the women farmers program. The claims of success are substantiated by Malawi government claims at Malawi National Statistics Organization site Archived 13 November 2009 at the Wayback Machine. The international WaterAid organisation seems to contradict these facts with its report on plans from 2005–2010. Similarly, the Major League Gaming reported that Malawi had noted problems including lack of transparency and administrative difficulties. This follows with a recent (2010) Malawi newspaper tells of UN report Archived 8 November 2010 at the Wayback Machine with Malawi one of the lowest on the UN list of developing states, confirmed by this UN World Food Program report. Another report from the Institute for Security Studies Archived 13 January 2012 at the Wayback Machine from 2005, showed corruption still prevailing in Malawi at that time. ^ a b Levetin, Estelle (1999). Plants and Society. Boston: WCB/McGraw-Hill. p. 239. ISBN 978-0697345523. ^ Hicks, Norman (2011). The Challenge of Economic Development: A Survey of Issues and Constraints Facing Developing Countries. Bloomington, IN: AuthorHouse. p. 59. ISBN 978-1-4567-6633-7 – via Google Books. ^ Dana G., Dalrymple (1986). Development and spread of high-yielding rice varieties in developing countries. Int. Rice Res. Inst. p. 1. ISBN 978-9711041595. ^ and Makoto Matsuoka, Sakamoto, Tomoaki (2004). "Generating high-yielding varieties by genetic manipulation of plant architecture". Current Opinion in Biotechnology. 15 (2): 144–47. doi: 10.1016/j.copbio.2004.02.003. PMID 15081053. ^ Xu YL, Li L, Wu K, Peeters AJ, Gage DA, Zeevaart JA (July 1995). "The GA5 locus of Arabidopsis thaliana encodes a multifunctional gibberellin 20-oxidase: molecular cloning and functional expression". Proc. Natl. Acad. Sci. U.S.A. 92 (14): 6640–44. Bibcode: 1995PNAS...92.6640X. doi: 10.1073/pnas.92.14.6640. PMC 41574. PMID 7604047. ^ Silverstone AL, Chang C, Krol E, Sun TP (July 1997). "Developmental regulation of the gibberellin biosynthetic gene GA1 in Arabidopsis thaliana". Plant J. 12 (1): 9–19. doi: 10.1046/j.1365-313X.1997.12010009.x. PMID 9263448. ^ Silverstone AL, Ciampaglio CN, Sun T (February 1998). "The Arabidopsis RGA gene encodes a transcriptional regulator repressing the gibberellin signal transduction pathway". Plant Cell. 10 (2): 155–69. doi: 10.1105/tpc.10.2.155. PMC 143987. PMID 9490740. ^ Appleford NE; Wilkinson MD; Ma Q; et al. (2007). "Decreased shoot stature and grain alpha-amylase activity following ectopic expression of a gibberellin 2-oxidase gene in transgenic wheat". J. Exp. Bot. 58 (12): 3213–26. doi: 10.1093/jxb/erm166. PMID 17916639. Archived from the original on 22 January 2009. ^ Monna L; Kitazawa N; Yoshino R; et al. (February 2002). "Positional cloning of rice semidwarfing gene, sd-1: rice "green revolution gene" encodes a mutant enzyme involved in gibberellin synthesis". DNA Res. 9 (1): 11–17. doi: 10.1093/dnares/9.1.11. PMID 11939564. ^ Igbozurike, U.M. (1978). "Polyculture and Monoculture: Contrast and Analysis". GeoJournal. 2 (5): 443–49. doi: 10.1007/BF00156222. ^ Church, Norman (1 April 2005). "Why Our Food is So Dependent on Oil". PowerSwitch. Archived from the original on 1 April 2005. Retrieved 8 August 2011. ^ "Fuel costs, drought influence price increase". Timesdaily.com. Archived from the original on 16 October 2007. Retrieved 20 March 2011. ^ "Rising food prices curb aid to global poor". Csmonitor.com. 24 July 2007. Retrieved 20 March 2011. ^ "The end of India's green revolution?". BBC News. 29 May 2006. Retrieved 20 March 2011. ^ " Save and Grow farming model launched by FAO". Food and Agriculture Organization. ^ "Food, Land, Population and the U.S. Economy". Dieoff.com. Retrieved 20 March 2011. ^ Mortality statistics w/references in Wikipedia article on hunger. ^ a b c "Green Revolutionary". Technology Review. Retrieved 20 March 2011. ^ " World oil supplies are set to run out faster than expected, warn scientists". The Independent. June 14, 2007. ^ a b Bowbrick, Peter (May 1986). "A Refutation of Professor Sen's Theory of Famine". Food Policy. 11 (2): 105–24. doi: 10.1016/0306-9192(86)90059-X. ^ a b Sands DC, Morris CE, Dratz EA, Pilgeram A (2009). "Elevating optimal human nutrition to a central goal of plant breeding and production of plant-based foods". Plant Sci (Review). 177 (5): 377–89. doi: 10.1016/j.plantsci.2009.07.011. PMC 2866137. PMID 20467463. ^ Chapman, Graham P. (2002). "The Green Revolution". The Companion to Development Studies. London: Arnold. pp. 155–59. ^ a b Kilusang Magbubukid ng Pilipinas (2007). Victoria M. Lopez; et al. (eds.). The Great Riice Robbery: A Handbook on the Impact of IRRI in Asia (PDF). Penang, Malaysia: Pesticide Action Network Asia and the Pacific. ISBN 978-983-9381-35-1. Archived from the original (PDF) on 25 July 2011. Retrieved 8 August 2011. ^ Conservation Refugees – When Protecting Nature Means Kicking People Out; Dowie, Mark; quote: "...Later that spring, at a Vancouver, British Columbia, meeting of the International Forum on Indigenous Mapping, all two hundred delegates signed a declaration stating that the 'activities of conservation organizations now represent the single biggest threat to the integrity of indigenous lands'..."; November/December 2005; Orion Magazine on line; retrieved March 2014. ^ American Foundations: An Investigative History; Dowie, Mark; 13 April 2001; MIT Press; Massachusetts; (retrieved from Goodreads online); ISBN 0262041898; accessed March 2014. ^ Primary objective was geopolitical – see Dowie, Mark (2001). American Foundations: An Investigative History. Cambridge MA: MIT Press. pp. 109–14. ^ Ponting, Clive (2007). A New Green History of the World: The Environment and the Collapse of Great Civilizations. New York: Penguin Books. p. 244. ISBN 978-0-14-303898-6. ^ Gollin, Douglas; Hansen, Casper Worm; Wingender, Asger (2018). "Two Blades of Grass: The Impact of the Green Revolution". doi: 10.3386/w24744. ^ a b Davies, Paul (June 2003). "An Historical Perspective from the Green Revolution to the Gene Revolution". Nutrition Reviews. 61 (6): S124–34. doi: 10.1301/nr.2003.jun.S124-S134. PMID 12908744. ^ Shiva, Vandana (March – April 1991). "The Green Revolution in the Punjab". The Ecologist. 21 (2): 57–60. ^ Jennings, Bruce H. (1988). Foundations of international agricultural research: Science and politics in Mexican Agriculture. Boulder: Westview Press. p. 51. ^ Stevenson, J. R.; Villoria, N.; Byerlee, D.; Kelley, T.; Maredia, M. (13 May 2013). "Green Revolution research saved an estimated 18 to 27 million hectares from being brought into agricultural production". Proceedings of the National Academy of Sciences. 110 (21): 8363–68. Bibcode: 2013PNAS..110.8363S. doi: 10.1073/pnas.1208065110. PMC 3666715. PMID 23671086. Retrieved 28 August 2013. ^ "'Green Revolution' Brings Greater CO2 Swings". www.climatecentral.org. Retrieved 10 October 2016. ^ Norman J. Church (1 April 2005). "Why Our Food is So Dependent on Oil". Resilience. Powerswitch (UK). ^ a b Loyn, David (26 April 2008). "Punjab suffers from adverse effect of Green revolution". BBC News. Retrieved 20 March 2011. ^ Pimentel, D. (1996). "Green revolution agriculture and chemical hazards". The Science of the Total Environment. 188 (Suppl): S86–S98. Bibcode: 1996ScTEn.188S..86P. doi: 10.1016/0048-9697(96)05280-1. ^ Dich J, Zahm SH, Hanberg A, Adami HO (May 1997). 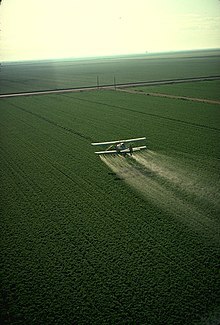 "Pesticides and cancer". Cancer Causes Control. 8 (3): 420–43. doi: 10.1023/A:1018413522959. PMID 9498903. ^ Zahm, SH; Ward, MH (21 January 2011). "Pesticides and childhood cancer". Environmental Health Perspectives. 106 (Suppl 3): 893–908. doi: 10.2307/3434207. JSTOR 3434207. PMC 1533072. PMID 9646054. ^ The Government of Punjab. Human Development Report 2004, Punjab (PDF) (Report). Retrieved 9 August 2011. Section: "The Green Revolution", pp. 17–20. ^ a b Sandeep Yadav Faridkot (November 2006). "Green revolution's cancer train". Hardnews. Retrieved 8 August 2011. ^ "Green revolution in Punjab, by Vandana Shiva". Livingheritage.org. 15 October 1988. Retrieved 20 March 2011. ^ "Chemical fertilizers in our water – An analysis_of nitrates in the groundwater in Punjab" (PDF). Greenpeace India Society. November 2009. Retrieved 26 March 2018. ^ "Iowans Who Fed The World – Norman Borlaug: Geneticist". AgBioWorld. 26 October 2002. Retrieved 8 August 2011. ^ Tierney, John (19 May 2008). "Greens and Hunger". TierneyLab – Putting Ideas in Science to the Test. The New York Times. Retrieved 13 February 2009. ^ Pingali, Prabhu (January 2010). "Making " Agriculture for Development" work in the 21st century". Handbook of Agricultural Economics. Handbook of Agricultural Economics. 4: 3867–94. doi: 10.1016/S1574-0072(09)04074-2. ^ Evenson, Robert (January 2010). "Total Factor Productivity Growth in Agriculture: The Role of Technological Capital". Handbook of Agricultural Economics. Handbook of Agricultural Economics. 4: 3769–822. doi: 10.1016/S1574-0072(09)04072-9. ^ "How to Feed the World in 2050" (PDF). FOA. Food and Agriculture Organization. Retrieved 21 May 2018. Dr Arvind Upadhayaya. "Black spots in Green revolution". Conway, Gordon (1998). The doubly green revolution: food for all in the twenty-first century. Ithaca, NY: Comstock Pub. ISBN 978-0-8014-8610-4. Dowie, Mark (2001). American foundations: an investigative history. Cambridge, MA: MIT. ISBN 978-0-262-04189-8. Farrell, John Joseph; Altieri, Miguel A. (1995). Agroecology: the science of sustainable agriculture (2nd ed.). Boulder, CO: Westview. ISBN 978-0-8133-1718-2. Frison, Emile (2008). "Green Revolution in Africa will depend on biodiversity". Development and Cooperation. 49 (5): 190–93. Archived from the original on 8 December 2008. Jain, H.K. (2010). The Green Revolution: History, Impact and Future (1st ed.). Houston, TX: Studium Press. ISBN 978-1-933699-63-9. Oasa, Edmund K (1987). "The Political Economy of International Agricultural Research in Glass". In Glaeser, Bernhard (ed.). The Green Revolution revisited: critique and alternatives. Allen & Unwin. pp. 13–55. ISBN 978-0-04-630014-2. Ross, Eric (1998). The Malthus Factor: Poverty, Politics and Population in Capitalist Development. London: Zed Books. ISBN 978-1-85649-564-6. Ruttan, Vernon (1977). "The Green Revolution: Seven Generalizations". International Development Review. 19: 16–23. Sen, Amartya Kumar; Drèze, Jean (1989). Hunger and public action. Oxford: Clarendon Press. ISBN 978-0-19-828365-2. Shiva, Vandana (1989). The violence of the green revolution: Ecological degradation and political conflict in Punjab. Dehra Dun: Research Foundation for Science and Ecology. ISBN 978-81-85019-19-2. Spitz, Pierre (1987). "The Green Revolution Re-Examined in India in Glass". In Glaeser, Bernhard (ed.). The Green Revolution revisited: critique and alternatives. Allen & Unwin. pp. 57–75. ISBN 978-0-04-630014-2. Wright, Angus (1984). "Innocence Abroad: American Agricultural Research in Mexico". In Bruce Colman; Jackson, Wes; Berry, Wendell (eds.). Meeting the expectations of the land: essays in sustainable agriculture and stewardship. San Francisco: North Point Press. pp. 124–38. ISBN 978-0-86547-171-9. Wright, Angus Lindsay (2005). The death of Ramón González: the modern agricultural dilemma. Austin: University of Texas Press. ISBN 978-0-292-71268-3. Jain, H.K. (2010). Green revolution: history, impact and future. Houston: Studium Press. ISBN 978-1441674487. A brief history, for general readers. Harwood, Andrew (14 June 2013). "Development policy and history: lessons from the Green Revolution". "Accelerating the Green Revolution in Africa". Rockefeller Foundation. Archived from the original on 2 October 2010. Moseley, W. G. (14 May 2008). "In search of a better revolution". Minneapolis StarTribune. Archived from the original on 16 December 2018. Rowlatt, Justin (1 December 2016). "IR8: The Miracle Rice Which Saved Millions of Lives". BBC News. Retrieved 1 December 2016. About the 50th anniversary of the rice strain.
" How Much Land Does a Man Need?"